ALR2017 was held February 26 - March 1, 2017 at the Hilton Clearwater Beach, Florida. 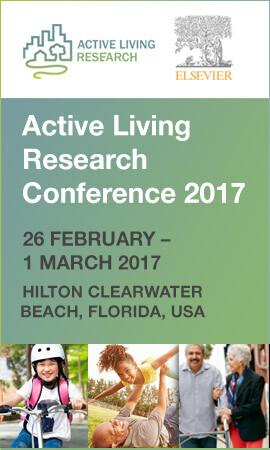 The Active Living Research Annual Conference brings together active living researchers and champions from over 30 disciplines to advance knowledge and action around active communities. The conference is the premier venue for policy-relevant research and cross sector exchange between scientists, practitioners and policy makers on how to create and sustain active living environments. The theme of the 2017 conference, “Active Living across the Life Span”, placed emphasis on the importance of promoting physical activity throughout the life-course, from childhood through mature adulthood, for optimal health and quality of life. The theme challenges us to consider the myriad of needs across age cohorts and how age and various settings affects opportunities for intervention(s). Life-course research and practice/policy examples can inform us about effective approaches to creating environments, policies, and programs to support active lifestyles throughout life, and can also help identify which interventions are appropriate for all ages and which need to be tailored. You can view the agenda by clicking on each day.